Having bungled up the dates for Ferran Adria's speaking engagement, Hubby and I got a shock when we entered the Grand Ballroom in Capella Hotel only to find ourselves the only "participants". After forking out a SGD6 entrance fee into Sentosa and burning SGD100 bucks on our (now wasted) tickets, we not content to just drive out just like that. So we decided to explore the island a little and check out the much talked about casino and Universal Studios. I chanced upon a most glorious sight- Hershey's Chocolate World. A chocoholics heaven, this shop is stocked with a mind boggling array of confections and souvenirs proudly stamped with the Hersheys and Reese logo. Reese is for folks who dig peanut butter. Peanut butter easter eggs that scream "EAT ME"
Anyone for candy scented candles? Hershey's kisses -who could live without these? Is it possible to crave 15 different kinds of food at one time? Addictive and spicy. More mushroom and fish glue please! I've been a member of Changi Club for years. To me, one of the main perks of joining the club is enjoying a quiet meal by the sea, watching the waves lap by and admiring the twinkling city lights from a distance. Its an ethereal experience which is fast becoming extinct in this increasingly urban citystate. Unfortunately, because of the club's obscure location, most restaurants seldom make it past their first year in business. Enter Soul Waterfront- a daring venture by the Amici group. The cafe serve Western and Italian dishes, with some Asian dishes like Mee Siam and Laksa thrown in for good measure. After 3 visits (twice for dinner and once for snacks) there, Hubby and I have decided to write off the place. Let's start with the good stuff first. The chef seems to possess reasonable skill in preparing meat and Italian dishes. If you are a meat lover, do consider ordering the braised lamb shank, which comes in a hearty portion and melts nicely in the mouth. Although this dish is one of the highest priced items in the menu (over 30 bucks), we feel it is money well spent. Hubby also tried the cabonara and thought it to be above average. The Asian items however pale in comparison to their Western counterparts. Particularly (un)memorable was the restaurant's laksa, which was a starchy mess of yellow noodles married with chokingly rich gravy. The dried mee siam fared slightly better, boasting a pleasurable wok hei flavor. The stale prawns in the dish however made me lose my appetite halfway into the meal. As if it couldn't get any worse, we decided to give the place another shot and popped in on a lazy weekend afternoon for a mid day snack. We ordered a fisherman's basket to share and were appalled when the order arrived. The assorted pieces of battered calamari, onion rings, fries and fish slices stank of stale oil and sported an unhealthy looking brownish yellow hue. This is a perfect case of a simple dish gone wrong. If the restaurant doesn't care enough about the health of its patrons, then it is not a restaurant worth patronising. Even after dousing the dubious looking suspects in thick Maggi chilli sauce, hubby and I still couldn't bring ourselves to finish this dish. Bad food is occasionally salvaged by good service. Not in this case. Service was painfully slow. Our food easily took at least 30 mins to arrive even though there were no other patrons (except us) in plain sight. Staff seemed rather incompetent and did not seem to care about the grotty floors. In all our visits, there was always more than one item "not available" in the menu, which was a little frustrating. I'm not sure how long this restaurant will last. In any case, this is not one restaurant whose soul I will miss. I seldom have cravings for healthy food. Unfortunately, given my burgeoning waistline, healthy food is something I have had to sneak into my meal plans every once in a blue moon. Last week was one of such "healthy" days. At a loss what to eat, hubby and I decided to have dinner at Ministry of Food, since we hadn't visited the place in some time. The crowd at Ministry of Food is achingly young, making us feel a tad too old for our liking. Nonetheless I was hopelessly charmed by the restaurant's whimsical decor- complete with cherry blossom ceiling paper and Victorian chairs. Don't expect high quality Japanese food here. The menu looks extensive and the pictures are lovely but at the end of the day, the restaurant is just a well oiled franchise with standardised offerings catered to the mass market. I was highly disappointed with the char siew ramen. The char siew pieces were dry and tough, noodles were soggy and the gravy was weak. What a disaster. Thank goodness for the avocado salad which arrived thereafter. The dish was sight to behold with pretty cubes of avocado, tofu and cucumber neatly arranged in an elongated bowl with a sprinkling of almond flakes on the surface. Even its accompanying wasabi mayo dressing looked delectable. It has been a long time since I have eaten something so healthy and yummy. Although this is still not something I can eat every meal, it is definitely a big step forward. In fact, I am already thinking of replicating it at home. I can't believe it took me so long to learn about this place. This restaurant must be one of the best kept secrets of International Plaza. At first glance, the restaurant comes across as run down and cheena. The chairs and tables look at least 10 years old and the service staff comprise of old aunties with attitude. It takes effort to even locate the restaurant's signage. Punctuality is of the essence here. Whilst making advance reservations will probably save you the hassle of queuing, the aunties will only assign you a table when your whole party has arrived. Almost every table seems to know what to order. The claypot chicken with cabbage is a MUST TRY, with meat which literally falls off the bone and melts in your mouth. Equally exceptional is its accompanying gravy, which is best eaten with a plate of steaming white rice. Another perennial favorite among the lunch crowd is the hotplate tofu with egg and prawn. Resembling a pancake, this highly palatable dish is crispy on the outside but velvety soft on the inside. The addition of prawns adds increased texture and crunch to every bite. This is easily the best hotplate tofu I have ever eaten. To fulfil our daily vegetable intake, we also ordered a plate of sambal kangkong to share. It was fresh, tasty but otherwise ordinary. Equally lack lustre were the pork ribs, which tasted artificially sweet. Being greedy gremblins, my kakis and I decided to share a small bown of yam paste with ginko nuts for dessert. When it arrived, we couldn't help but notice that the yam paste was literally drowning in coconut cream. Undaunted, we gingerly dipped our spoons into the bowl and took a small nibble. This was definitely not the best yam paste we had eaten but at least it didn't taste as horrible as it looked. Note: The quality of the food seems to differ from visit to visit. When we visited the restaurant on a Friday, the chicken and tofu dishes were top notch. However, in a subsequent visit the following Wednesday, the portions seemed smaller, the chicken tasted slightly burnt and the prawns less fresh. Flushed with confidence after successfully making tau huay, I decided to embark on some extensive baking this weekend. First on the list? "Western" Carrot Cake. I never knew such a thing as "Western" Carrot Cake existed till high school years. Most Singaporeans are only accustomed to eating "Asian" Carrot Cake, which is sold in almost all wet markets as a breakfast treat. "Asian" Carrot Cake comprises of mashed cubes of turnip doused with sweet soy sauce and egg over a flaming wok. The slightly charred caramelized pieces are exceptionally delightful (but also very unhealthy). Since I am still very much a novice in baking, I decided to stick with the relatively straightforward recipe for "Western" Carrot Cake today. 3. Beat eggs, oil, vanilla and sugar in a large bown. Add sifted ingredients to creamed mixture and beat well. Stir in carrots and nuts till well combined. Pour into pans. 4. Bake for 50 mins until tester inserted in the centre comes out clean. Cool cake for 20 mins before removing it from pan. Can keep up to 2 days without refridgeration. Verdict: I did not have 8X4 pans so I used a 12X4 pan instead. The cake was well cooked on the top and sides but seemed a little uncooked in the center. I had to place it back in the oven (covered with aluminium foil to prevent the top from burning) for another 20 mins before it cooked completely. Tastewise, I found the texture a little too dry but otherwise perfect. Looking back, I realise I had added only 1 cup of grated carrots when the recipe called for 2. Would that have made a difference? I saw this for sale at Etsy and thought it was hilarious. 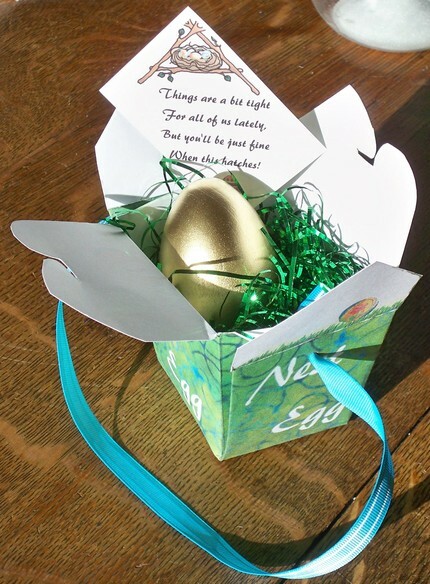 Introducing...the Golden Nest Egg. Retailing at only USD5 a piece. It is hoped that the good humor that results will provide an attitude 'stimulus package' and a 'bailout' from any lingering traces of 'depression'." Check out seller SewnInTheSpirit's store here for more quirky offerings.